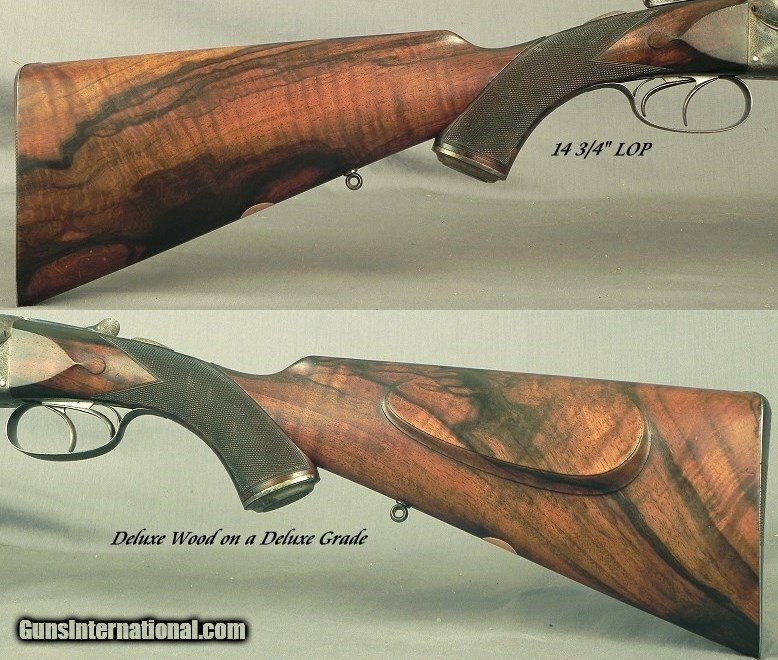 Last week this Lang double rifle popped up on the market and made it onto my “Double You Don’t Want to Miss” list. Why did make it? Just look at its condition. I love original condition, especially on doubles from the 19th century. 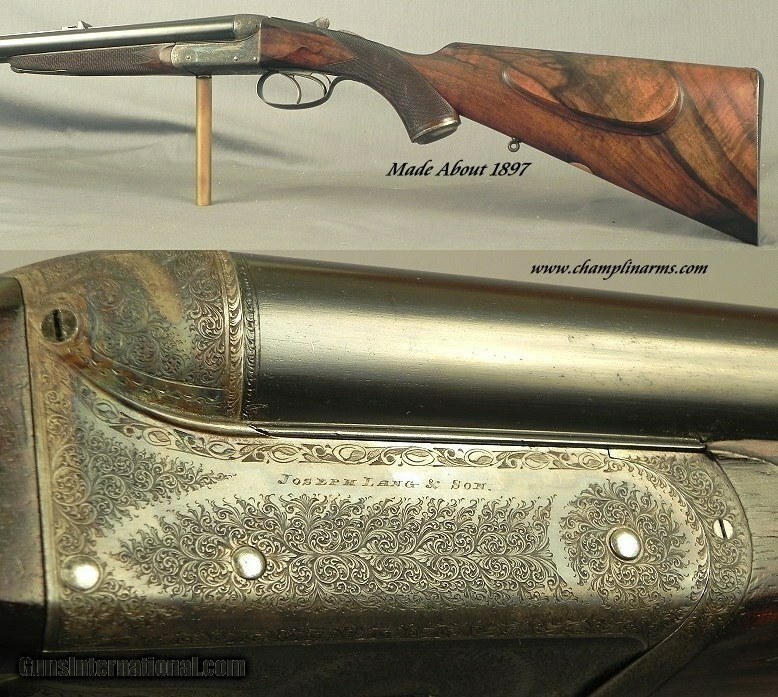 This awesome side-by-side has tons of it, and I doubt I’m alone in saying I would love to own it. Even though the barrels have been reblacked, the rest of it is incredible. Just look at how crisp the drop points are! 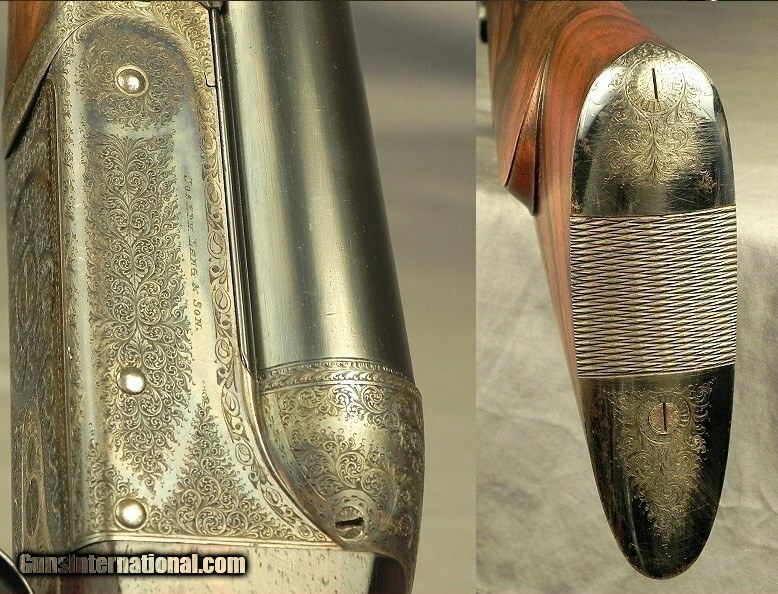 This was a utilitarian-grade gun in its day, so it’s very unusual for it to have made it to the 21st century in this kind of shape. 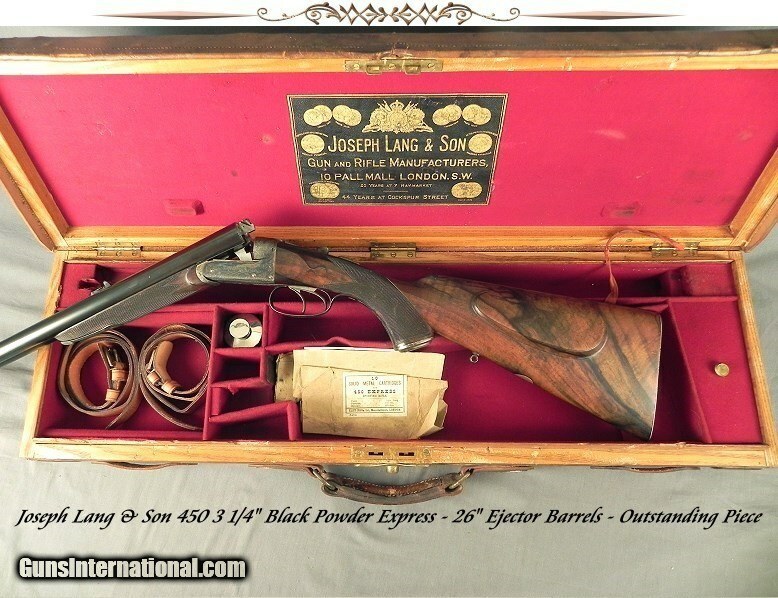 JOSEPH LANG & SON 450 3 1/4″ BPE- SxS DOUBLE RIFLE – 1897 DELUXE GRADE BOXLOCK TOPLEVER EJECT- EXC. PLUS BORES- 90% ORIG. CASE COLORS- 95% SUPERB & UNUSUAL ENGRAVING- O&L ORIG. 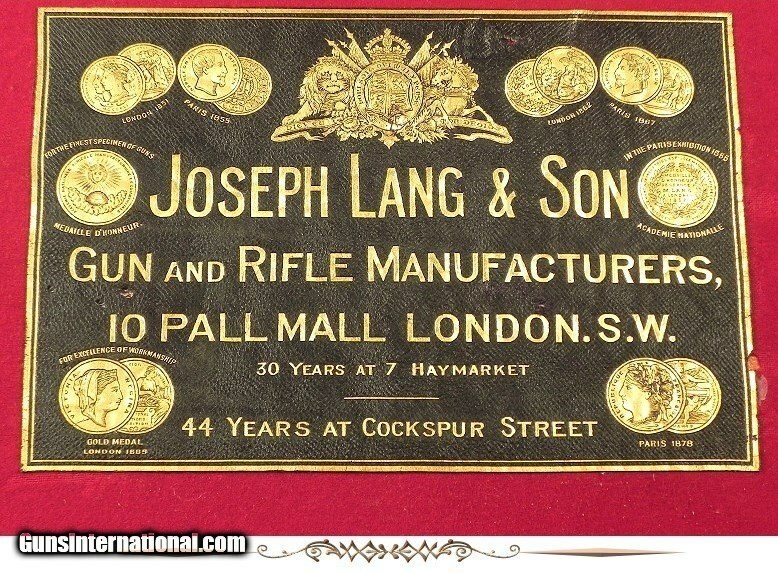 TRUNK: #8545, Joseph Lang & Son, 10, Pall Mall, London: An Extremely Nice Top Drawer Deluxe Joseph Lang & Son Boxlock Ejector 450 3 1/4″ BPE Made about 1897, Formerly owned by Lord Rossmore, Built on the Great Webley action with 26″ Ejector Dovetail Lump steel barrels with a Dolls Head Rib Extension Third Bite, Full length rib with 1 standing & 1 folding platinum lined rear sights, Proofed in London, Bushed strikers, Lever release forend, Steel engraved grip cap, Shadowline cheekpiece, Sling eyes, Double triggers, 14 3/4″ LOP over an engraved and checkered steel buttplate, 8 lbs. 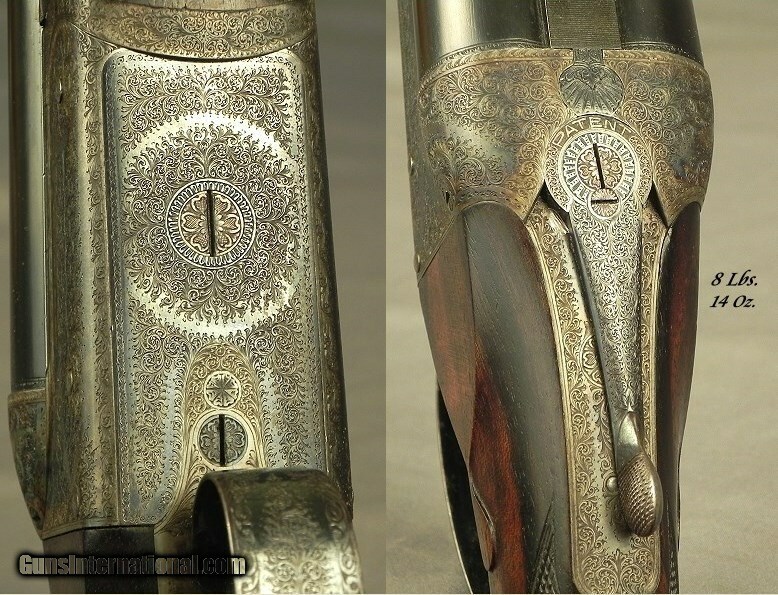 14 oz., Outstanding figured wood with excellent & deep black/brown color & contrast, 95% coverage of very fine scroll engraving the like of which is seldom seen to this detail of this era, The fully engraved trigger guard tang extends to the engraved steel grip cap. 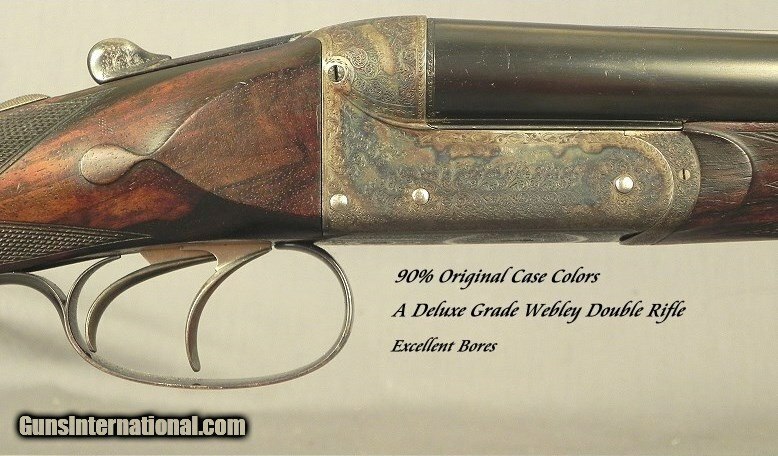 This vintage Classic still retains an honest 90% original case colors, The barrels have been 100% professionally re-blacked, The trigger guard & tang retain 98% original blue, The engraved steel buttplate has 80% original blue, The buttstock & forend with absolute original finish and they remain at 92-93% with handling marks from being around 121 years, The checkering is original and still at 97%, The breech face retains 99% of its original case colors, The inside of the forend has 98% case colors, Every screw inside & out is still 98-99%, As you would expect the bores are excellent plus condition and look like the day they walked out of Joseph Lang 121 years ago. The whole is cased in its original brass cornered oak & leather trunk with the correct trade label. 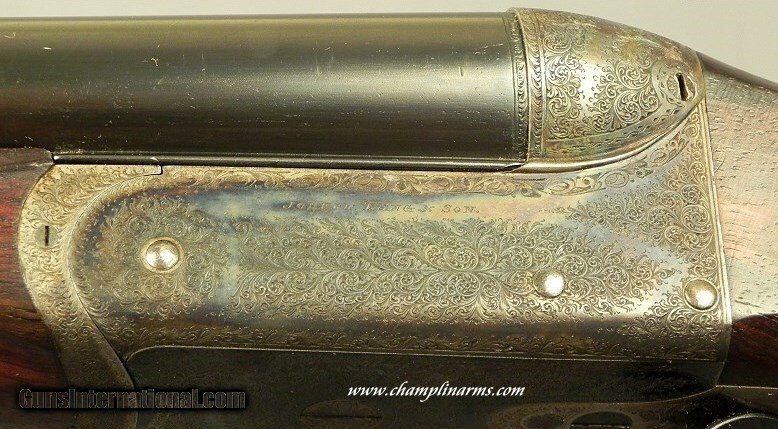 It has 2 each paper covers of period ammo from Eley Bros. for the 450 Express.